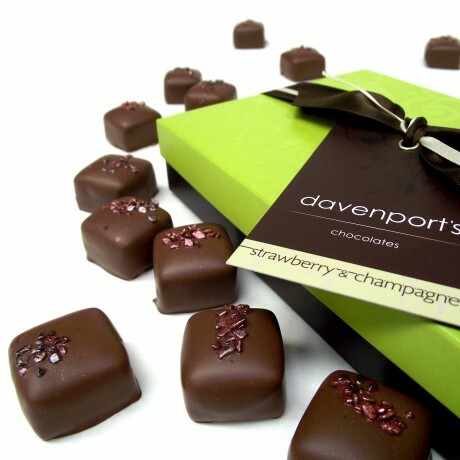 With strawberry paste and real Marc de Champagne mixed into rich, buttery ganache, Davenport's strawberry and champagne truffles are a perfect way to celebrate any occasion - they are equally comfortable at the Christmas table as they are on a park bench, listening to Wimbledon on the radio. 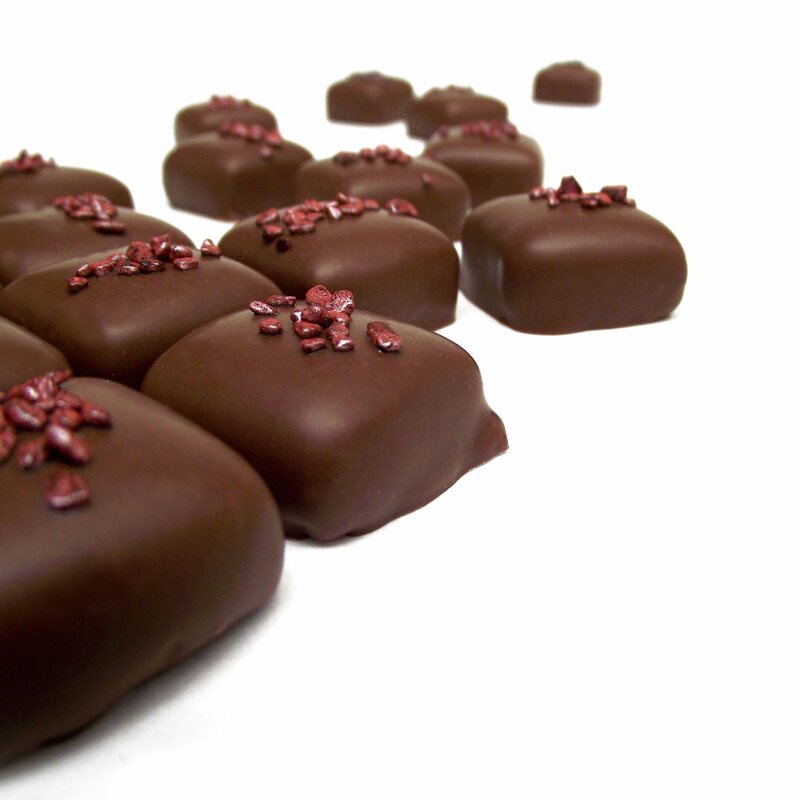 To reach the perfect combination of fizz and fruit, we hand-fold our ingredients together and enrobe them in milk chocolate before dusting each one with pink shimmery chocolate rubble. Milk Chocolate (Sugar, Cocoa Butter, Whole Milk Powder, Cocoa Mass, Emulsifier: Soya Lecithin, Natural Vanilla Flavouring),White Chocolate (Sugar, Cocoa Butter, Whole Milk Powder, Cocoa Mass, Emulsifier: Soya Lecithin, Natural Vanilla Flavouring), Cream (Milk), Butter (Milk), Marc de Champagne, Glucose, Strawberry Fruit Paste (Strawberries, Carrot Extract, Beetroot Extract, Modified Starch, Ethanol, Acidifier: Citric Acid, Maltodextrin), Colour Powder with Mica, Iron Oxides and Titanium Dioxide (E555, E171, E172). Contains: Milk and Soya. Made in a factory that works with nuts, peanut, wheat and egg. Per 100g: Energy 2268.3kJ/541.9kcal, Fat 35.5g (of which saturates 21.5g), Carbohydrate 47g (of which sugars 44.8g), Fibre 1.3g, Protein 5.7g, Salt 0.25g. Per 13g Serving: Energy 283.5kJ/ 67.6kcal, Fat 4.4g (of which saturates 2.7g), Carbohydrates 5.9g (of which sugars 5.6g), Fibre 0.2g, Protein 0.7g, Salt 0.03g.